Mahatma Gandhi with his surgeon Col. Maddock, Poona, February 1924. 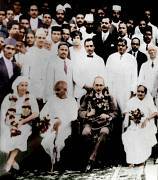 Mahatma Gandhi with his surgeon Col. Maddock, his nurse (left) and wife Kasturba,Poona, February 1924. Mahatma Gandhi at the end of the fast with Dr. Jivraj Mehta, Poona, February 1924. Mahatma Gandhi during his illness at Sassoon Hospital, Poona, March 1924. Mahatma Gandhi convalescing at “Palm Bun”, Juhu, Bombay, March-May, 1924. Mahatma Gandhi convalescing at ﾓPalm Bunﾔ, Juhu, Bombay, March-May, 1924.